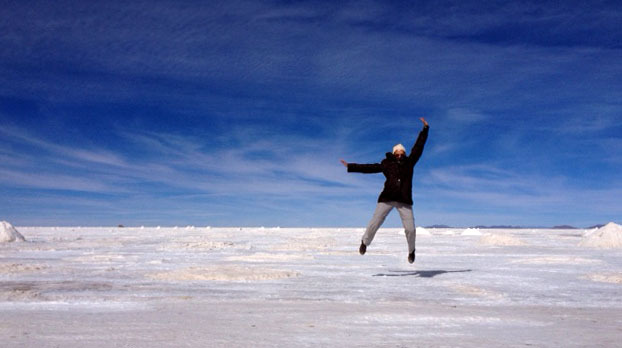 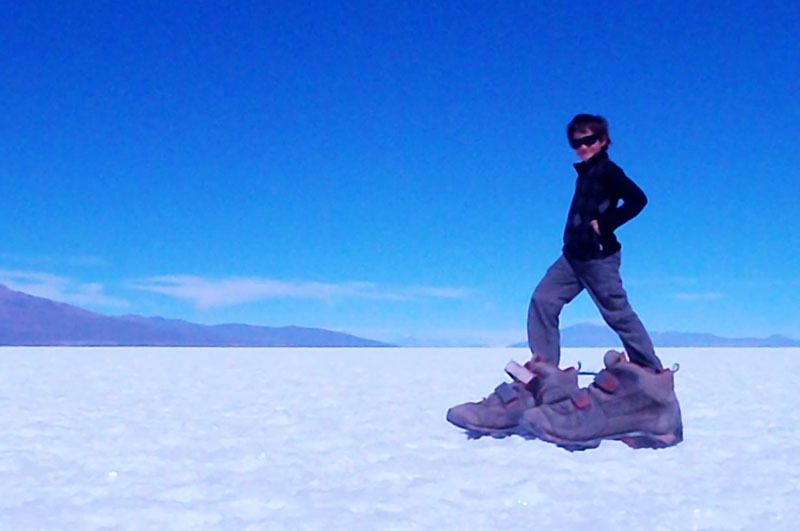 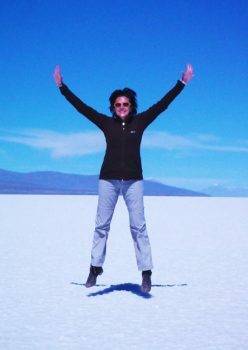 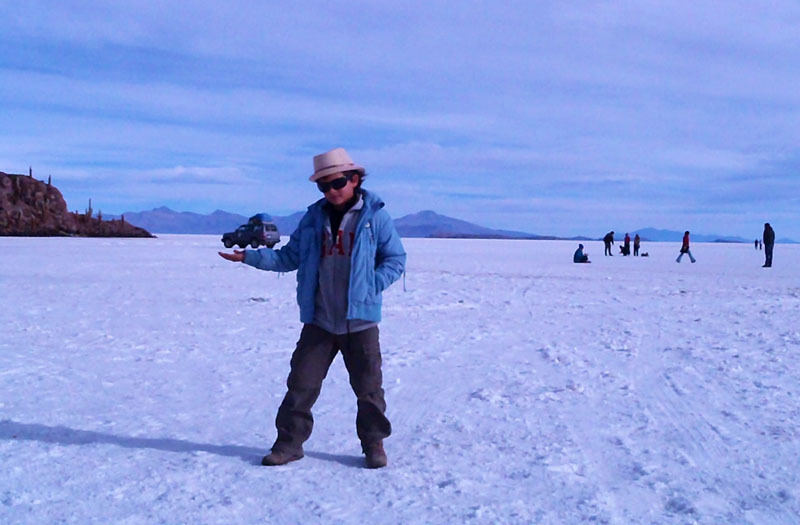 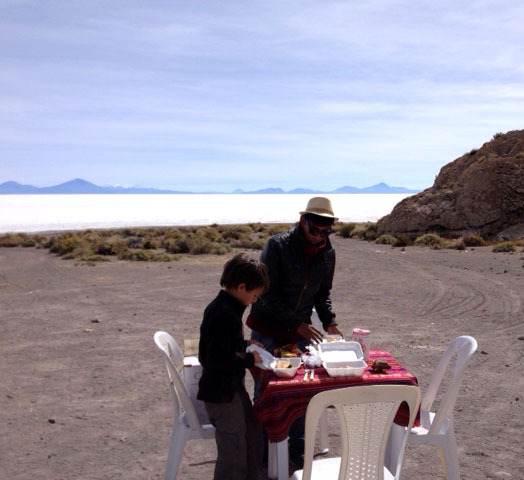 I have been to the Salar de Uyuni and Desert + Lagoons area twice before, but it had been a while since I last visited. Since then there have been some improvements to the infrastructure, which makes the visit easier and expands the itinerary options, all of which is great news! 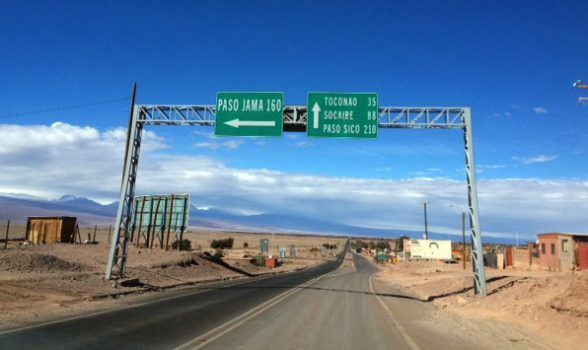 Visiting the entire area requires 3 or 4 days. 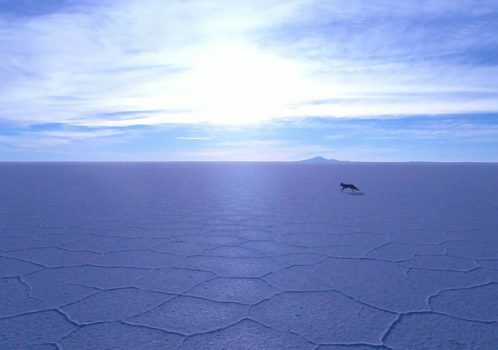 We have spent 4 wonderful if tough and cold days here, but again I have confirmed that this is one of the most fascinating spots on earth, at least in my experience. 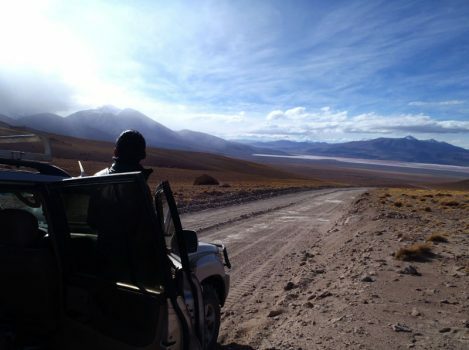 The photos we have taken can give you a small glimpse of the beauty and uniqueness of the landscape and the experience. 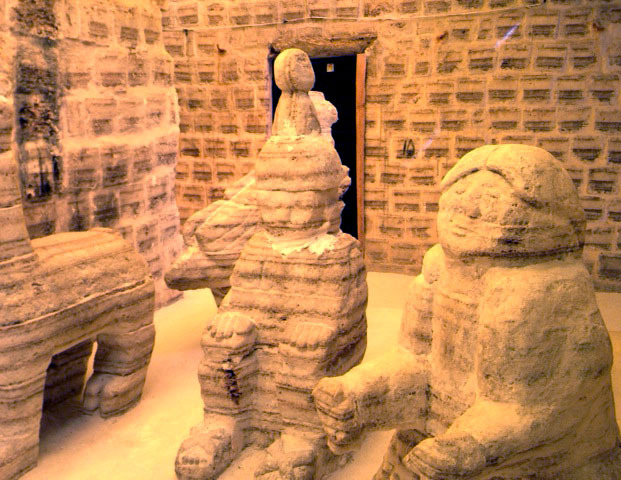 I highly recommend a visit to this area. I would divide the area in two sections: One is the Desert and Lagoons area and the other is the Salar. They are both wonderful. 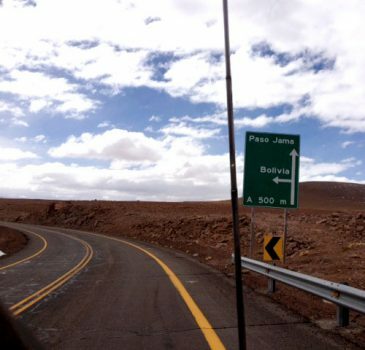 We have done both, but travellers can decide to do one or the other. I would recommend doing both if you come all the way to Bolivia. 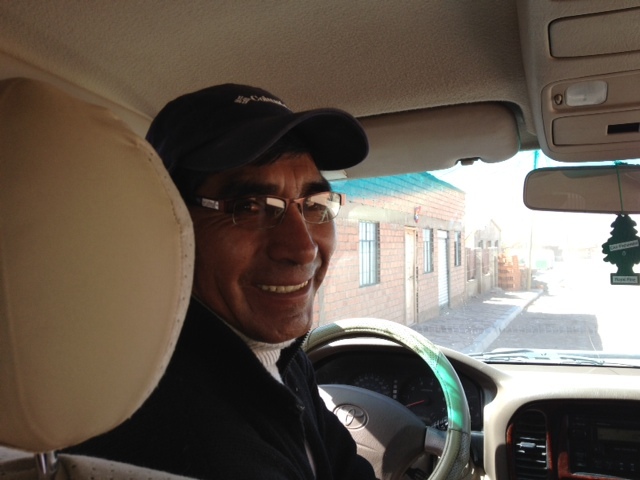 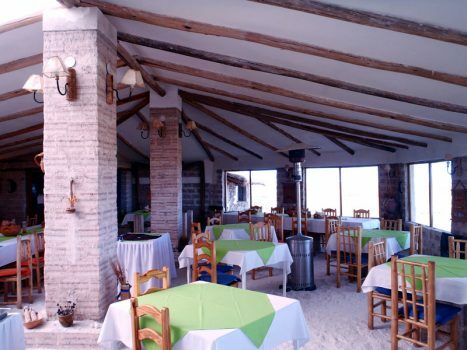 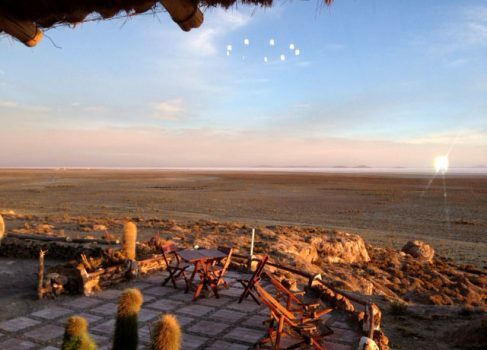 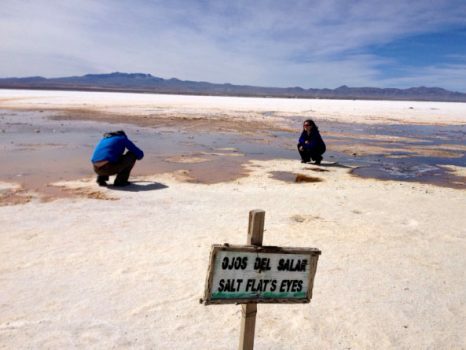 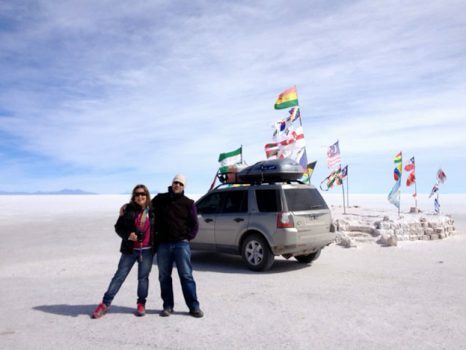 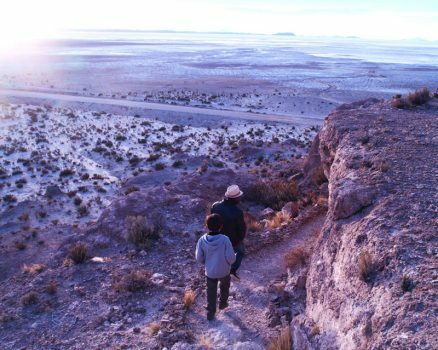 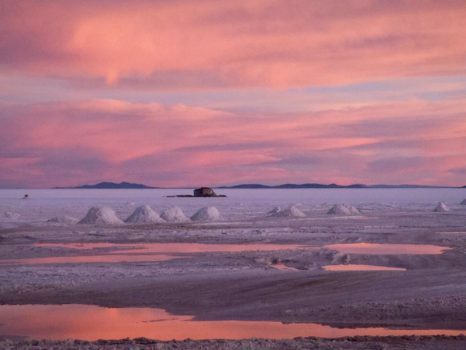 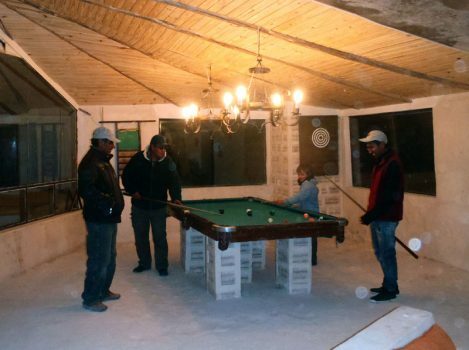 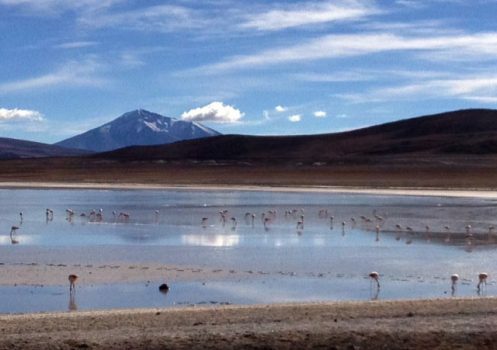 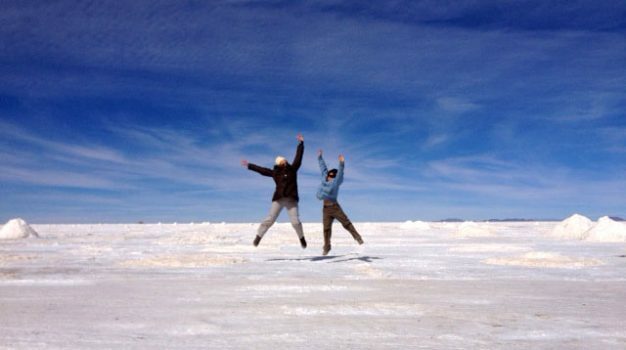 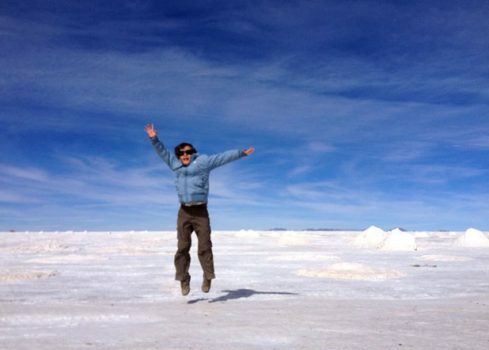 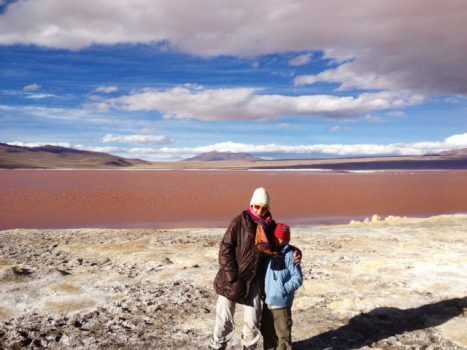 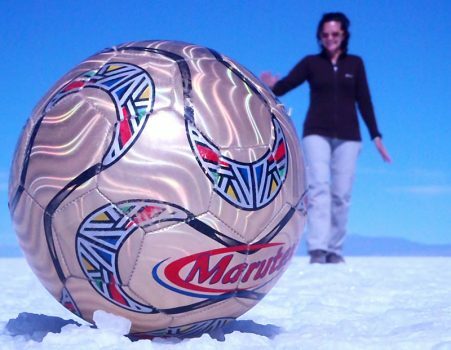 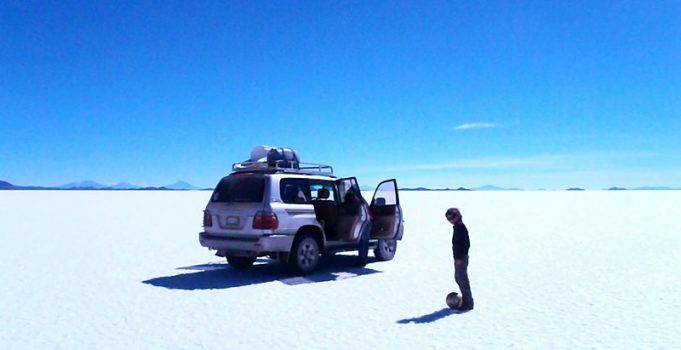 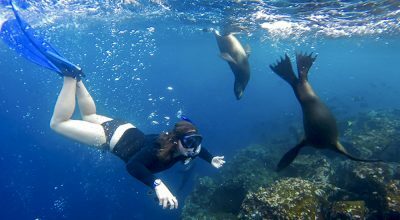 But there are people who are briefly visiting La Paz and are short of time, and would like to come to the Salar only, and that is possible in as short a time as 1 day 1 night, because now there are two daily flights into Uyuni from La Paz. 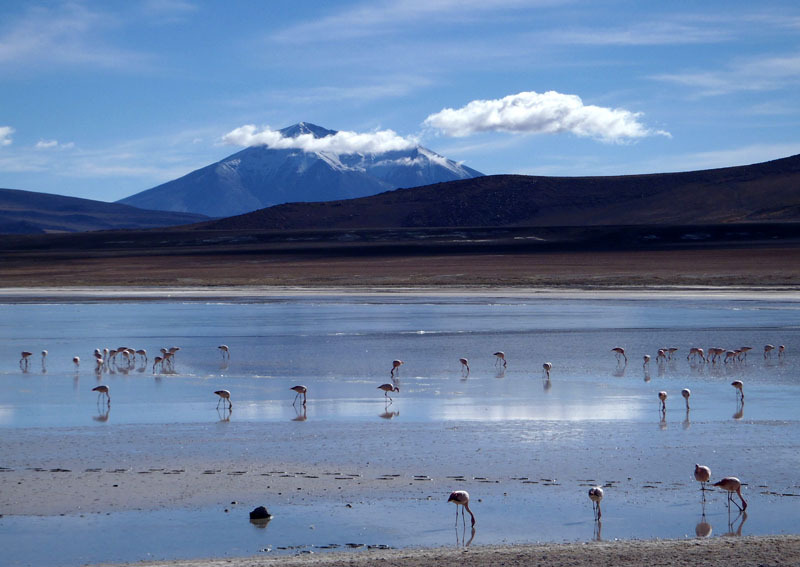 The Desert + Lagoons area is the area the between the Chilean border and the southern border of the Salar. This is a very large area and much road travel is required, approx 550kms driving in two days. 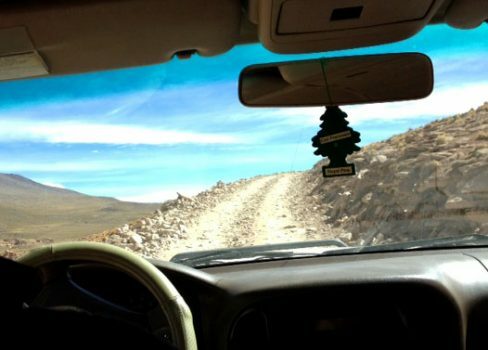 Roads are unpaved and unmarked, and some sections are rocky paths and can’t be called roads. There is no cellular coverage in this area and accommodation is basic and at very high altitude. 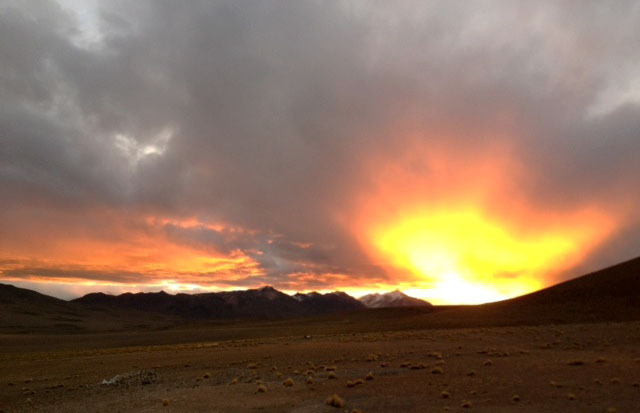 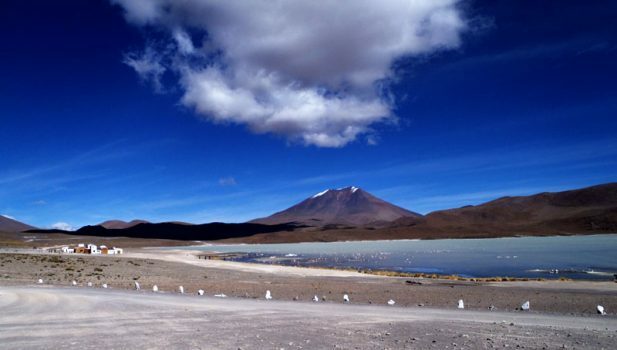 The average altitude during the two days necessary to visit this area is 4500m. 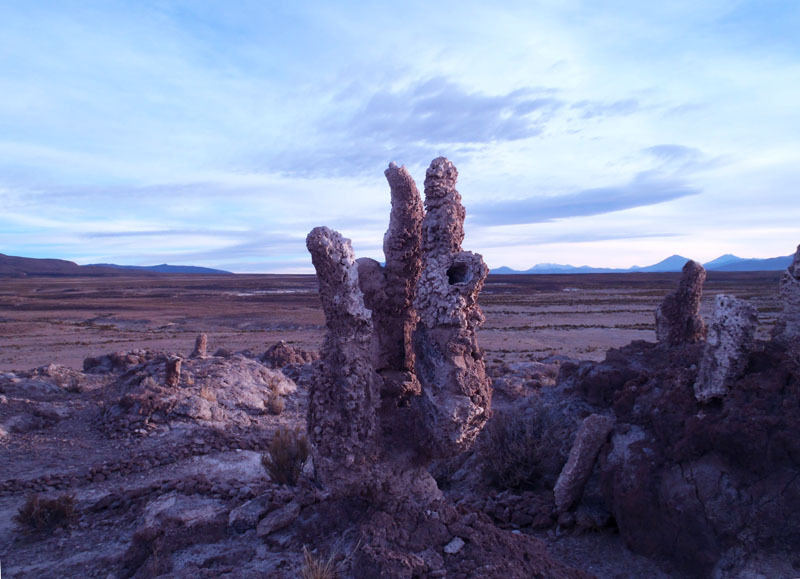 The attractions are the amazing: surrealist scenery, coloured lagoons, strange and surrealist landscapes, and bizarre rock formations. 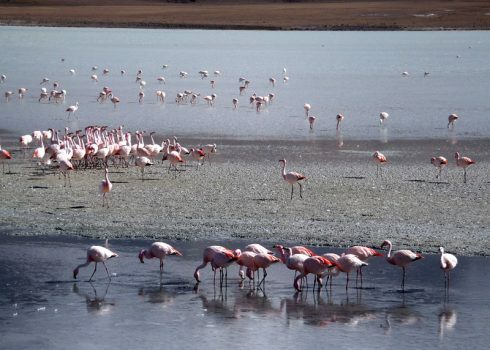 My favourite moment was the view of Laguna Hedionda teeming with bright pink and pastel pink coloured flamingos. (Andean, James and Chilean flamingos). 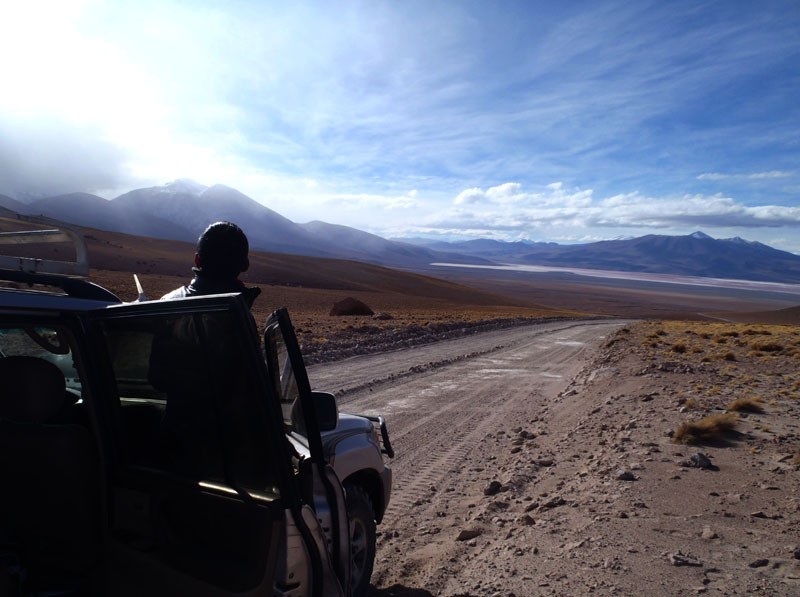 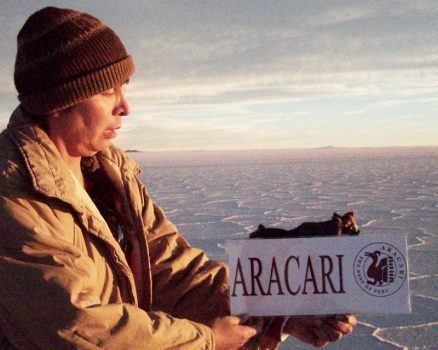 Access is via the Salar from the north or via Chile or Argentina from the South. 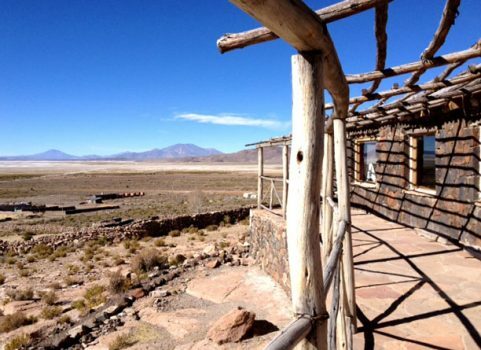 On our first day we travelled from the Chilean border (Hito Cajon) to the Hotel Tayka del Desierto in the middle of the desert in a location that they call “Ojo de Perdiz”. 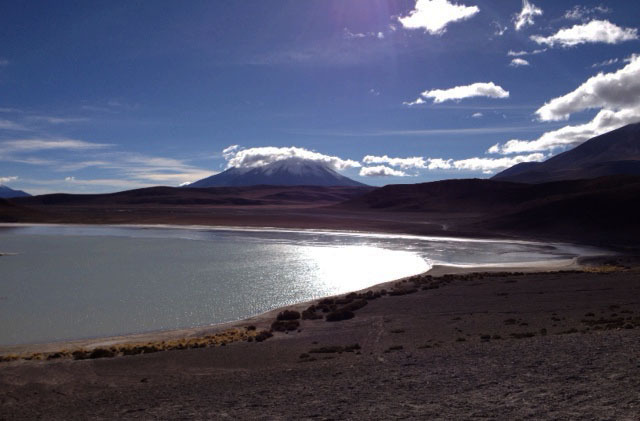 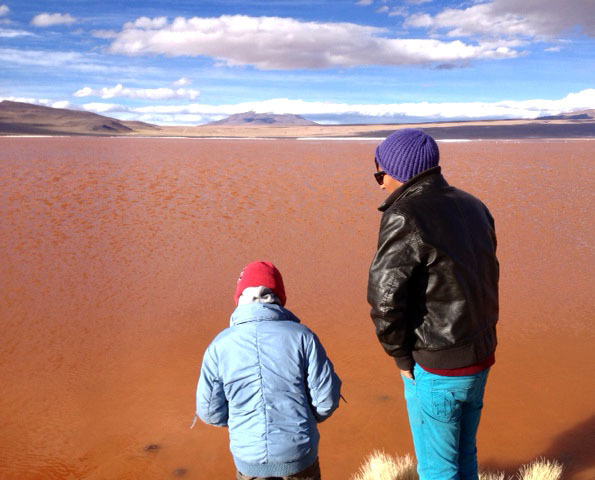 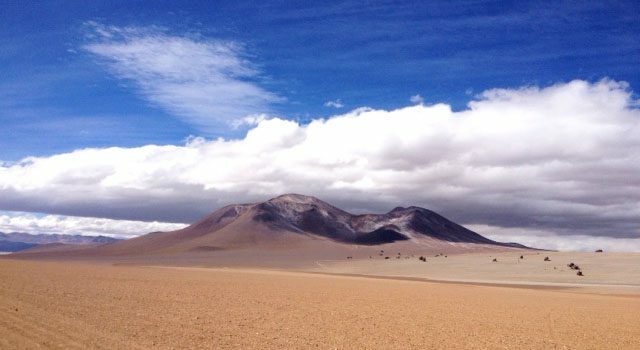 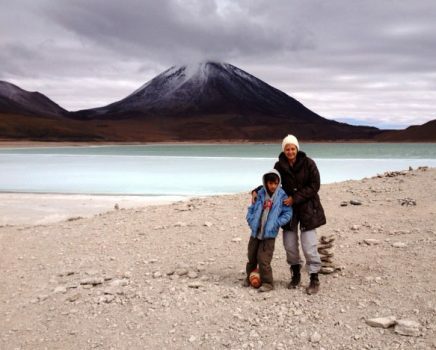 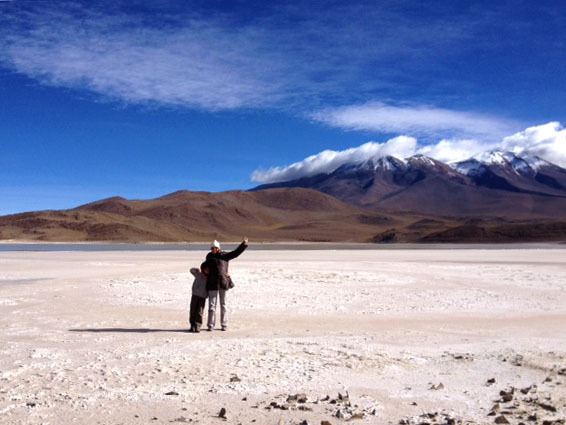 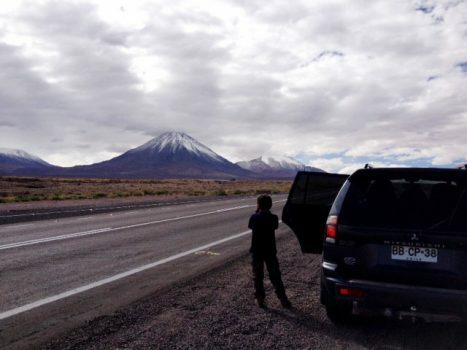 After crossing from San Pedro de Atacama and into Hito Cajon, we saw Laguna Verde with the backdrop of Volcan Licancabur, Laguna Colorada, Sol de Mañana geysers, the Dali Desert and the “Arbol de Piedra”. 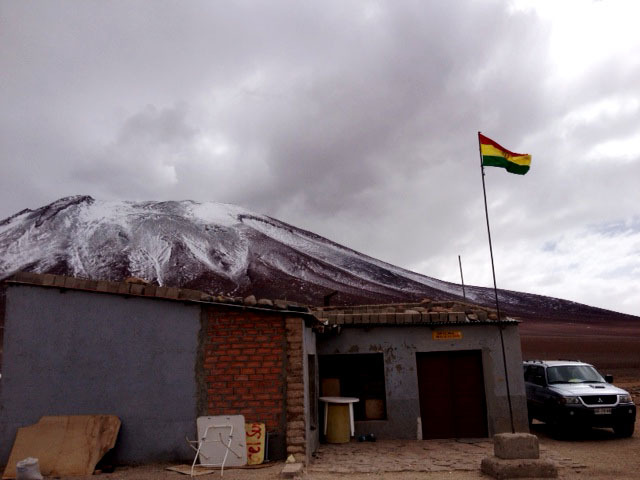 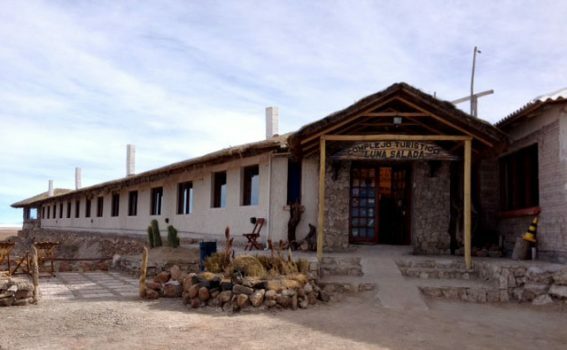 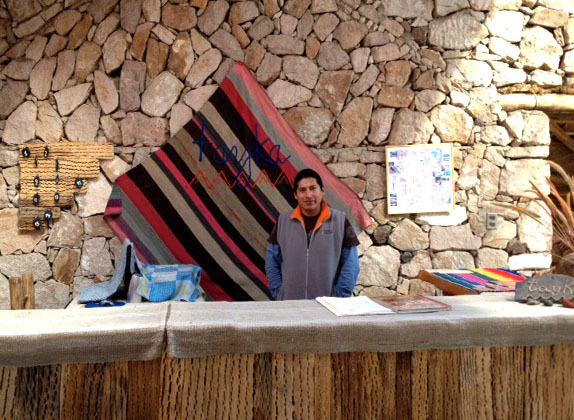 We stayed in the basic if efficiently Tayka del Desierto hotel, a 14 room hotel in the middle of nowhere….the most inhospitable (and coldest) places I have ever experienced! 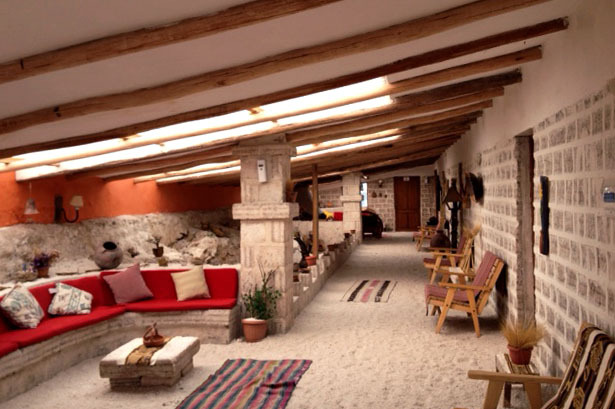 The hotel is built with natural materials (it is a community -based tourism project involving 4 hotels in the region) and energy is partially generated by solar panels and partly by a petrol generator. Electricity only runs for 4 hours in the evening and the heating doesn’t work when the hotel is full (which was our case) . 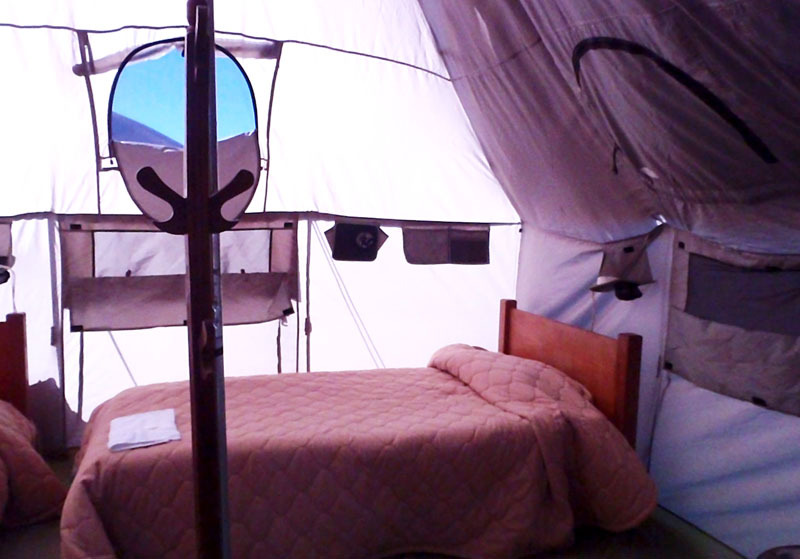 But rooms are clean, beds are comfortable and there are plenty blankets to keep you (or try to keep you) warm. 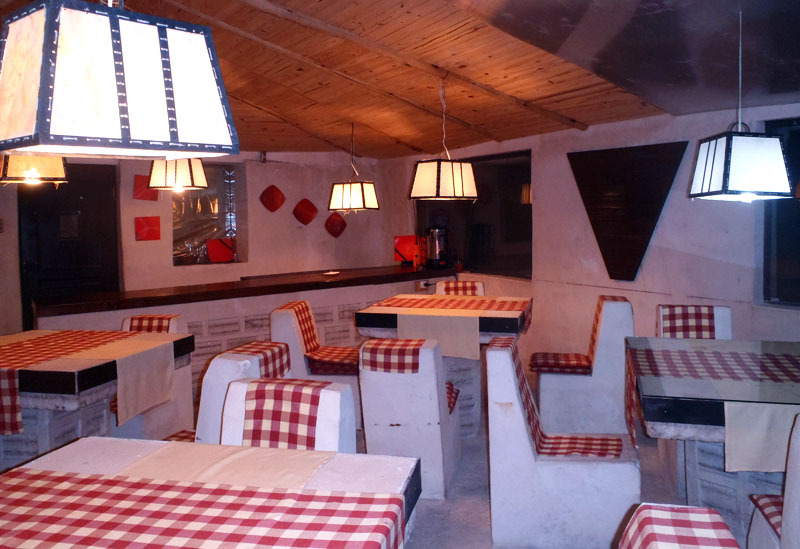 The staff are friendly and efficient, the dining room was cosy and the food was absolutely fine. It is an excellent spot to stay to visit this area. Certainly a better option than where I stayed 14 and 10 years ago, where proper lodging was non existent in this area. 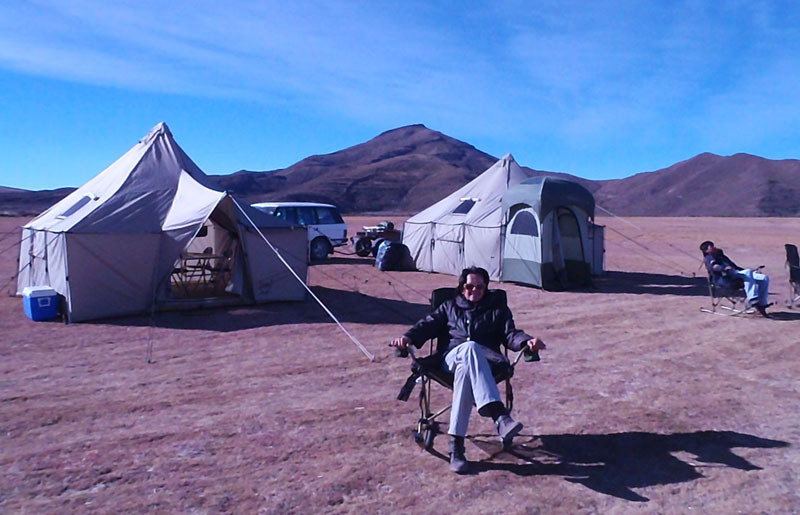 We had to bring our own food and sleeping bags and stay in improvised home stays. After viewing Volcan Ollague from afar we had our picnic the village of San Cristobal which is now Bolivia’s most important mining project, run by a Japanese company. This dreary spot in the middle of the desert is the same place where I stayed when I first came to the area. 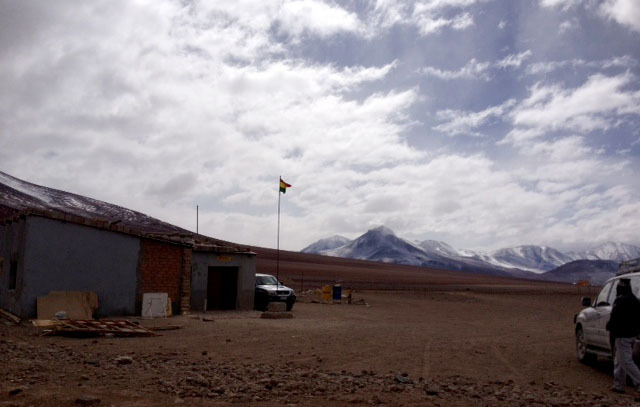 It now has an airstrip for the mining project and internet but little else. 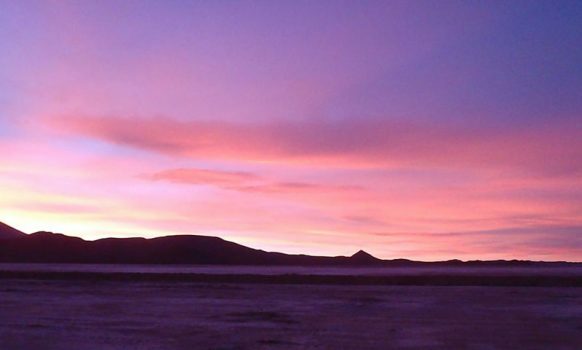 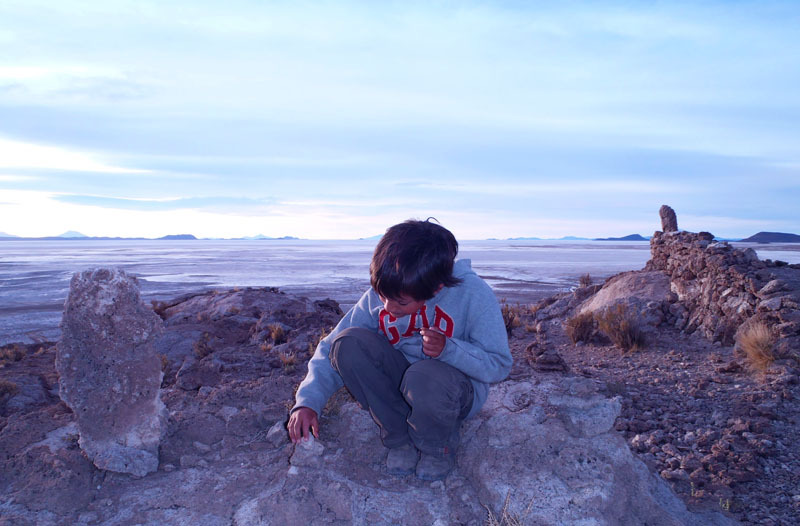 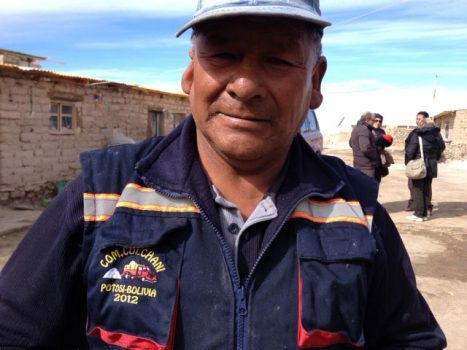 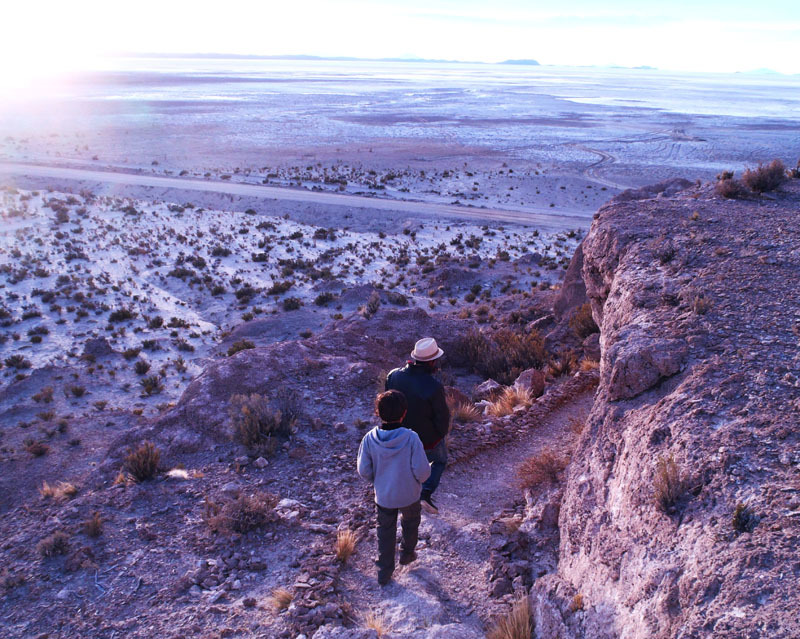 After a few more hours travel, in the evening we reached the town of Uyuni where we stopped briefly only to connect to the internet, but I regretted not visiting the “Cementerio de Trenes” . 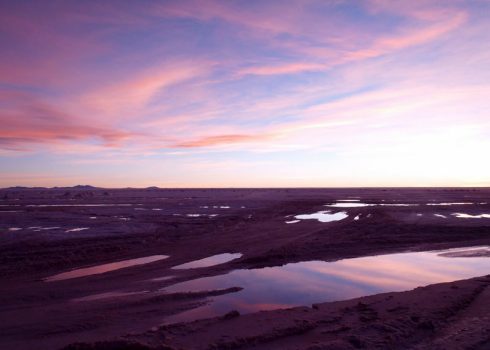 Uyuni was a major crossroads for the railway line due south to Argentina and Chile transporting mineral in the 19th century. 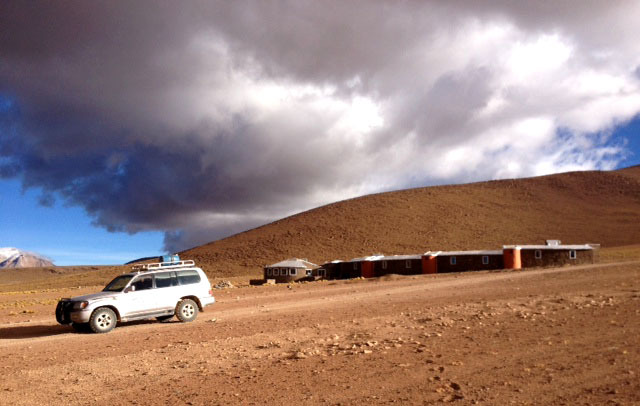 Now it is another grim town on the Altiplano. 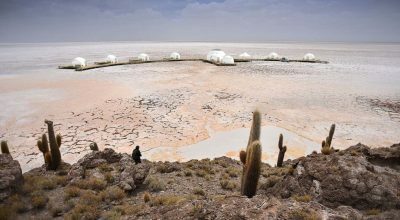 We were delighted to reach our home for the night, the best hotel on the shores of the Salar, the Salt Hotel called “Luna Salada” . There are three “Salt Hotels” but this is the best one. 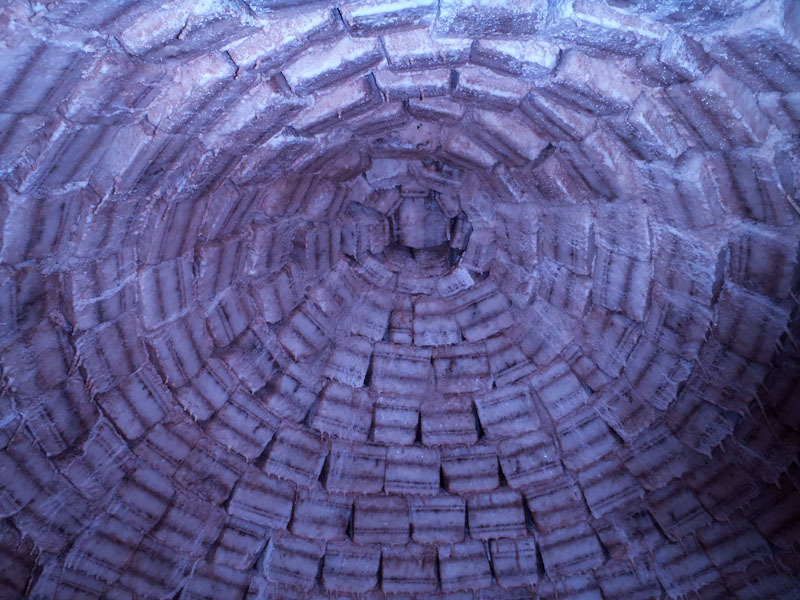 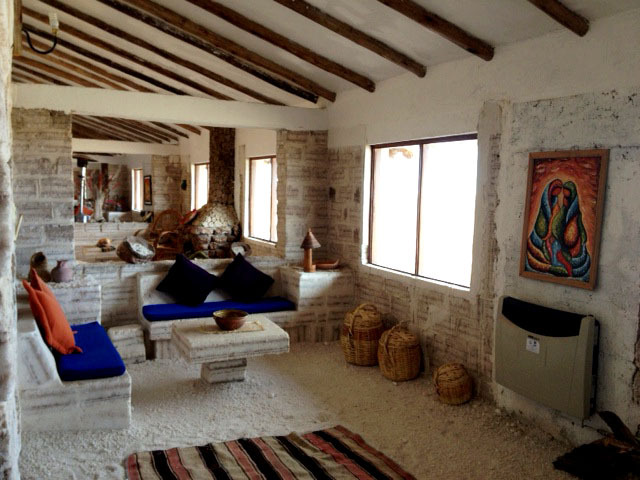 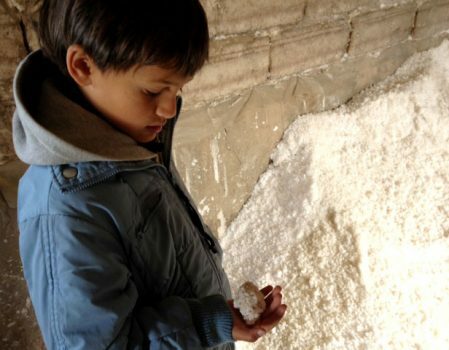 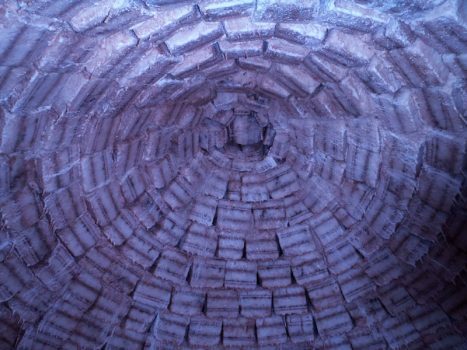 Yes, they are called salt hotels because they are entirely built out of salt! 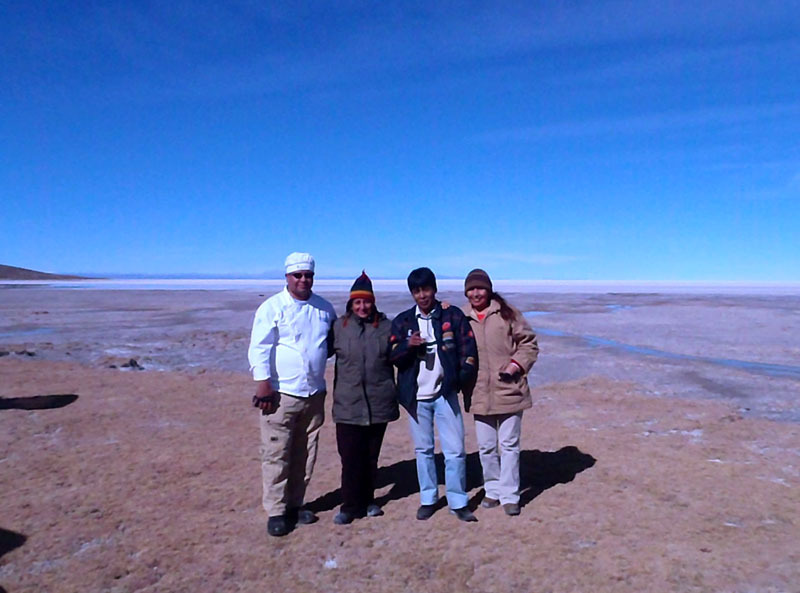 For the following two days we spent our time visiting the Salar, and exploring as much as possible. There are many possibilities here, like visiting remote communities or climbing Thunupa Volcano, the beautiful extinct volcano on the shores of the Salar. 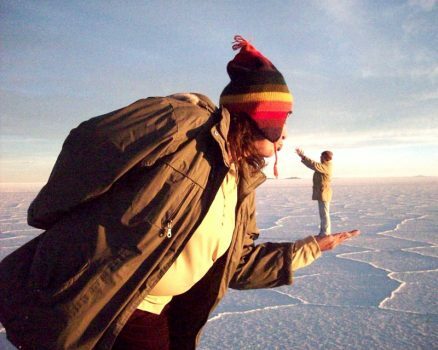 And/ or just monkeying around taking pictures of oneselves with no perspective! 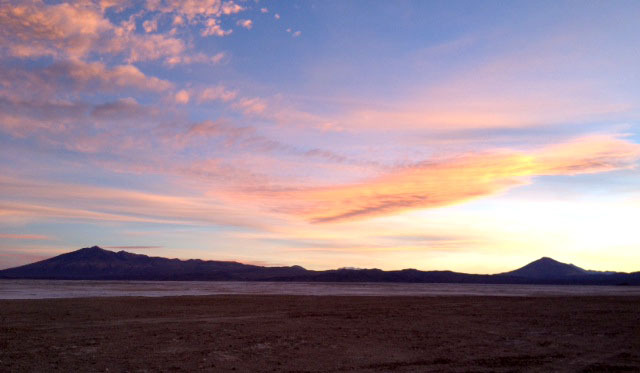 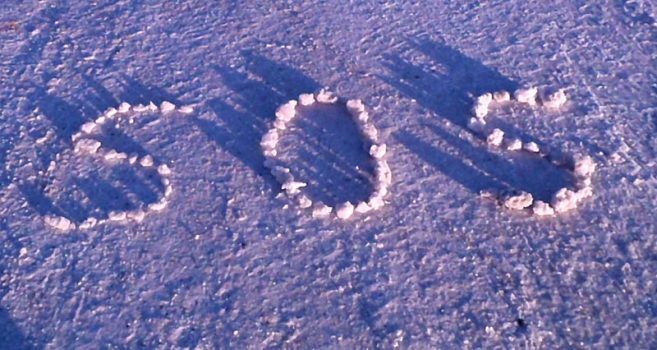 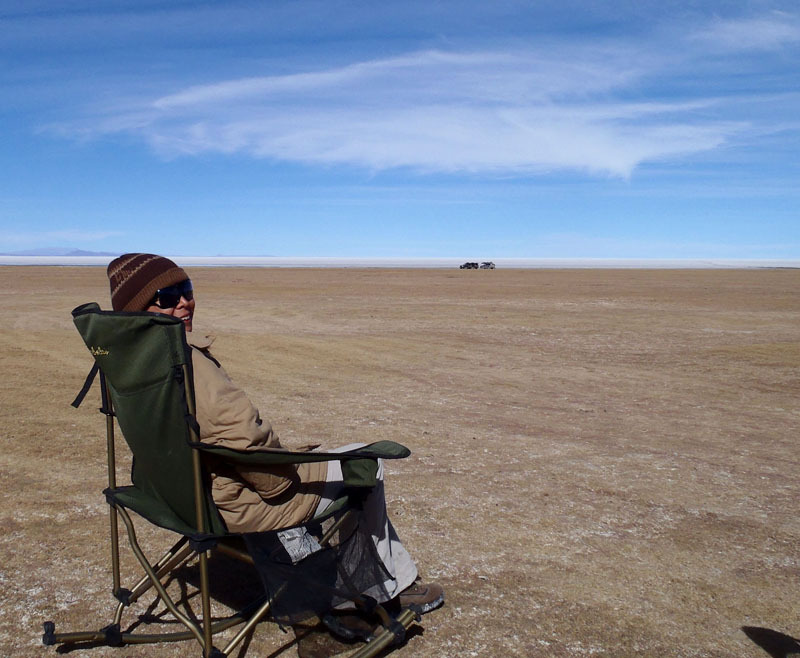 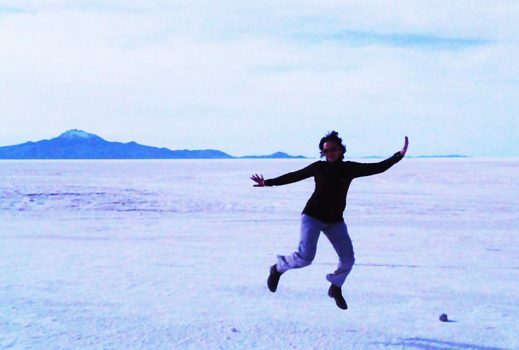 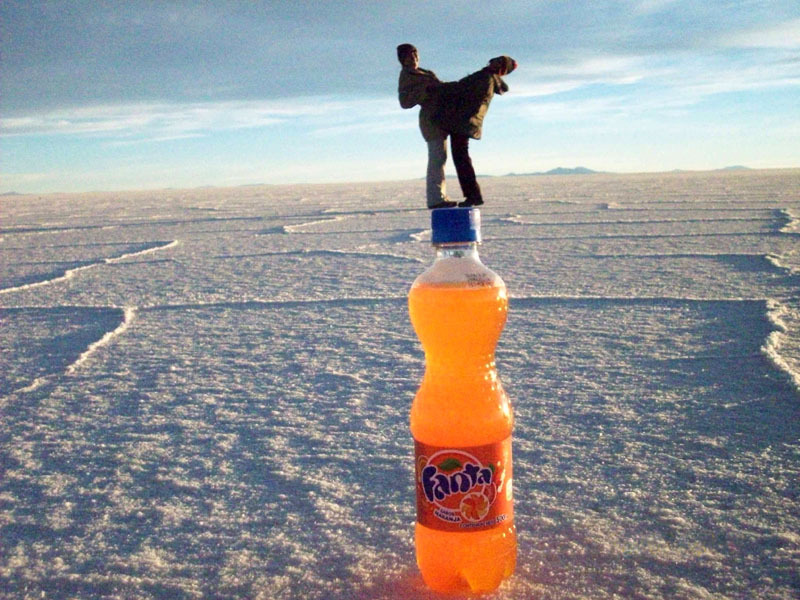 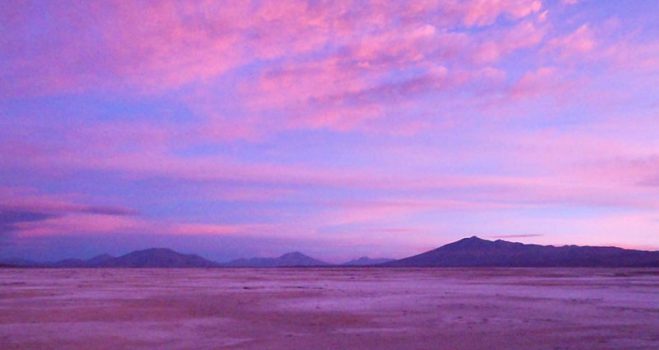 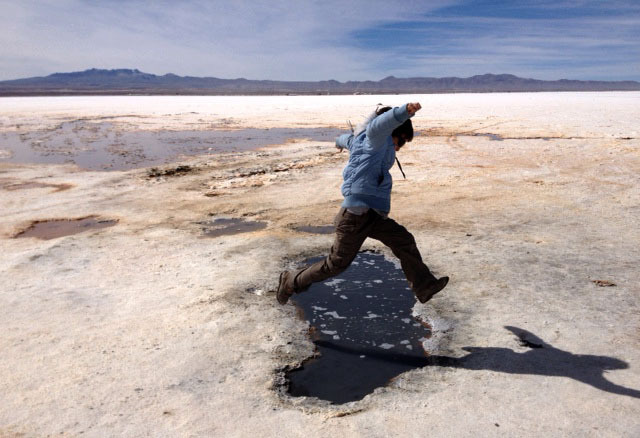 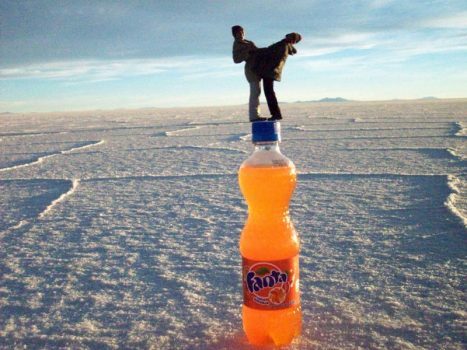 Most travellers spend a day only visiting the salar, and sadly most all do the same thing! 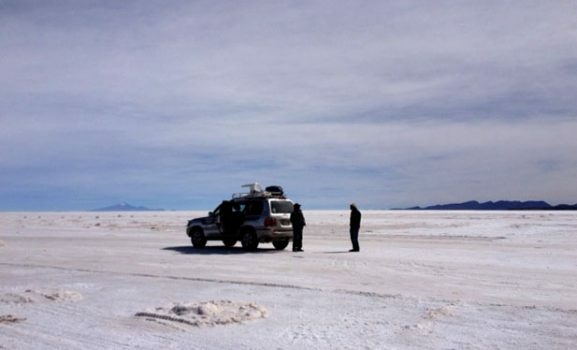 That is, they all go at the same time of the day to visit an island located in the middle of the Salar. This island is called Inca Wasi Island (confused by many with Isla Pescado which is a different island). 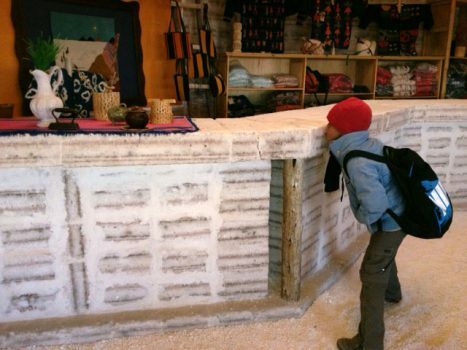 This becomes a terrible tourist trap between noon and 4 pm almost every day, especially during peak season. 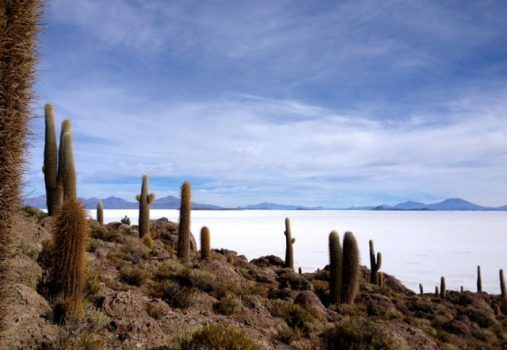 The island is scenic with hundreds of giant cacti which appear in most of the pictures depicting the salar. There is a restaurant and coffee shop and toilets and a well marked path that takes you to the top from where there are lovely views. 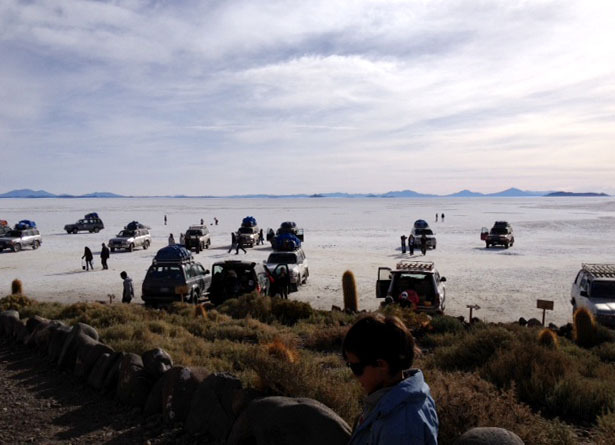 But during “peak time” it is absolutely packed with many dozens 4x4s and tourists picnicking. 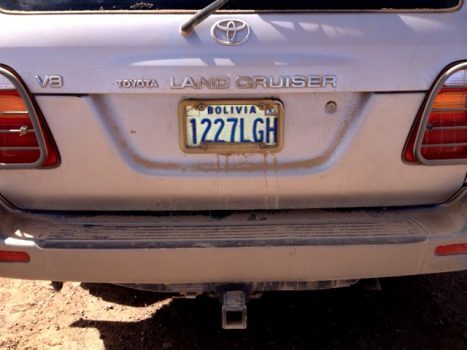 Terrible sight. 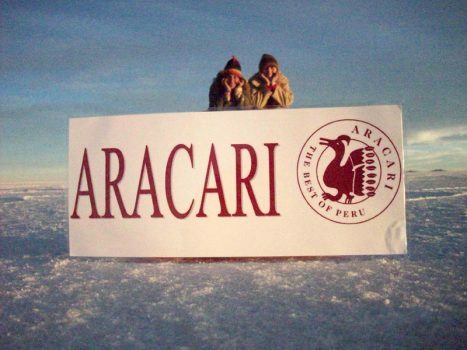 Best avoided, especially don’t go eat there. 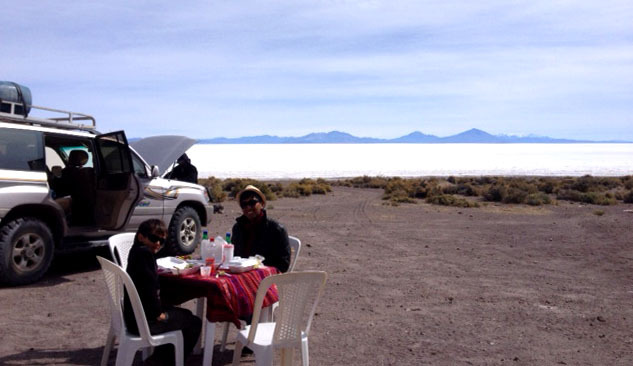 We were lucky to have the luxury of time and common sense so we lunched in a lovely secluded spot on our first day. 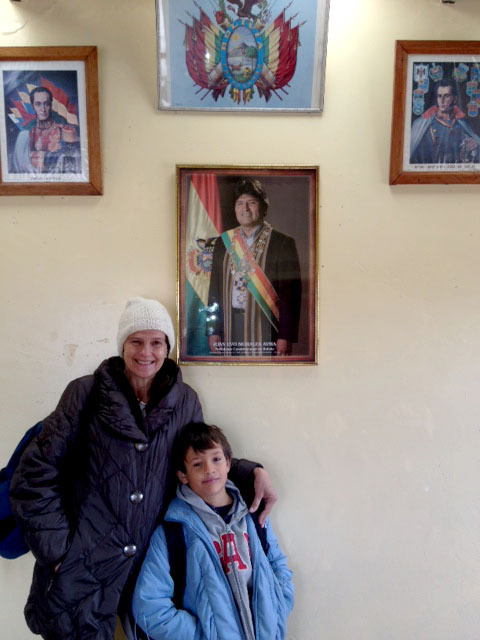 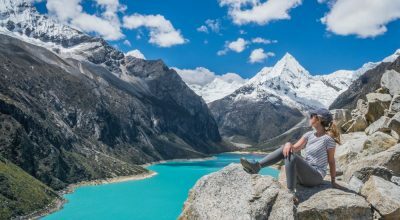 Here we had the chance to meet and chat with and interesting Argentine family who was travelling overland across Bolivia into Peru to visit Machu Picchu. 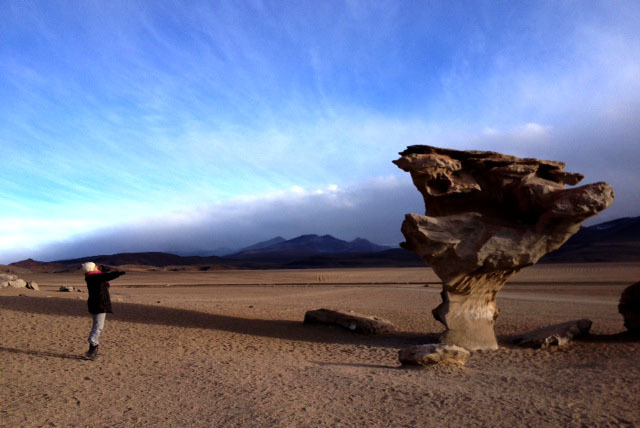 We took lots of great pictures and visited the interesting “Gruta de las Galaxias de las Dos Estrellas” on the shores of the Salar, an interesting cave with fascitinating rock formations resembling and underwater landscape. 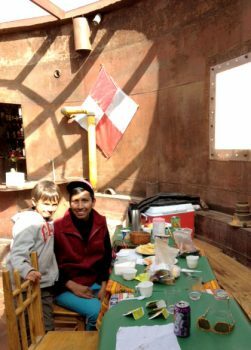 The “dos estrellas” are the two locals who have discovered the cave, that is the name they decided to give themselves! We hardly met anyone else during our visit today (except at Inca Wasi) and enjoyed the solitude and open space that is one of the highlights of a visit of the Salar. Our third night we stayed at another “Tayka Hotel”, this time Tayka de Piedra outside the village of San Pedro de Quemez. 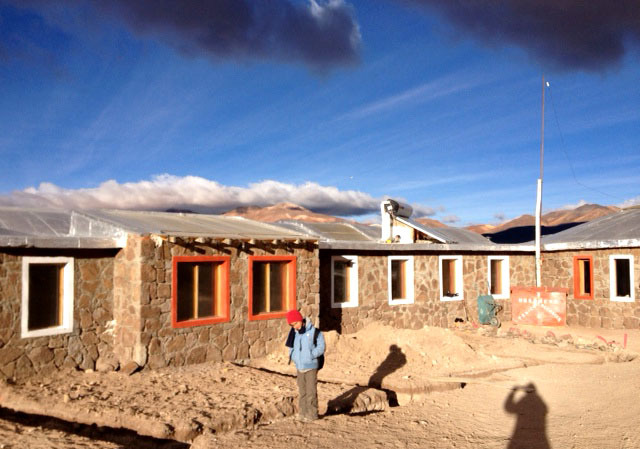 This hotel was again cosy, well run and this time much warmer and with functioning heating. 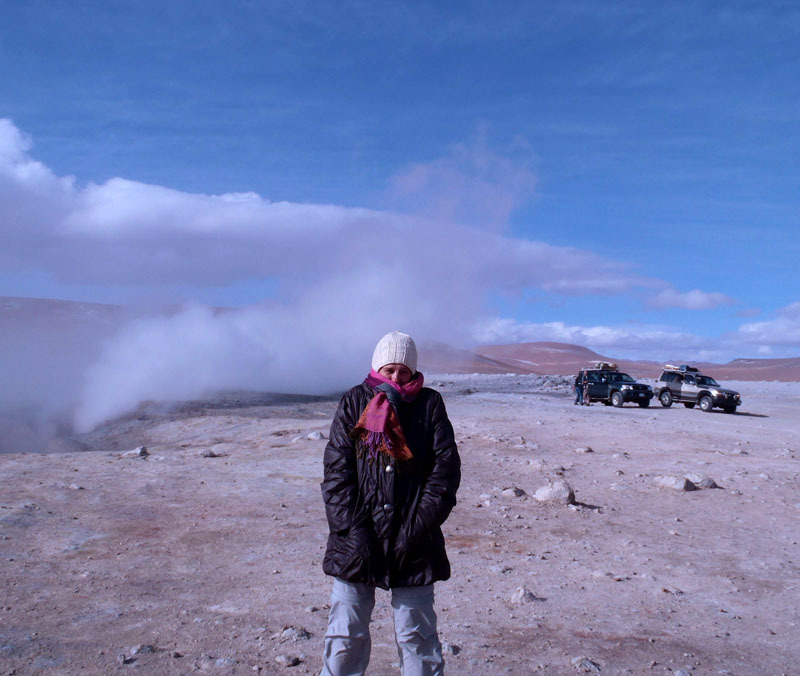 The location is much less remote and cold. 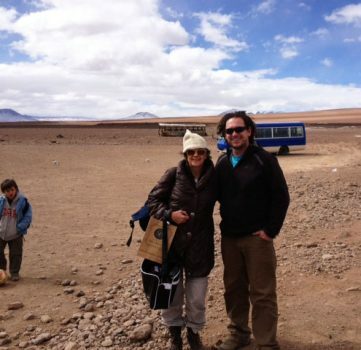 Our final day was spent on the little visited northern shores of the Salar, where, in “Jirira” one beautiful bay with Thunupa watching over us, we met Nora and Vicky from Aracari who arrived in the morning by plane from La Paz into Uyuini. 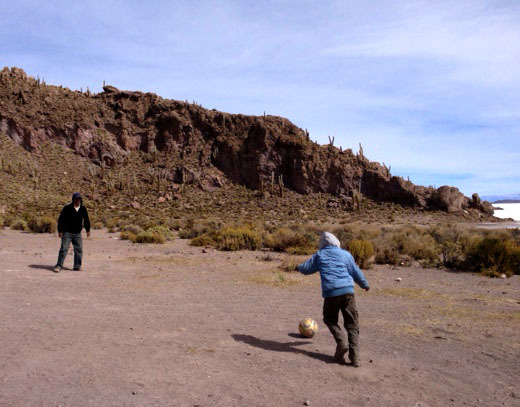 Together with our guides and drivers, we had a jolly and delicious luxury picnic and even a football match. 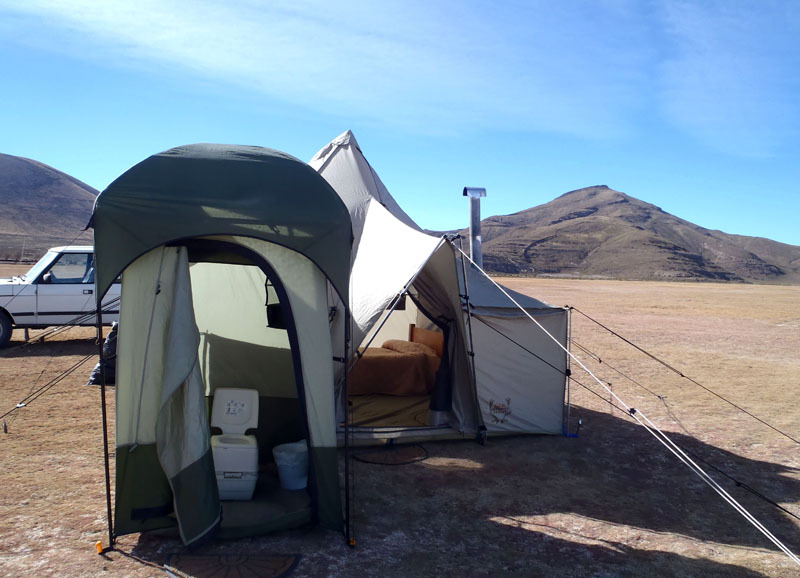 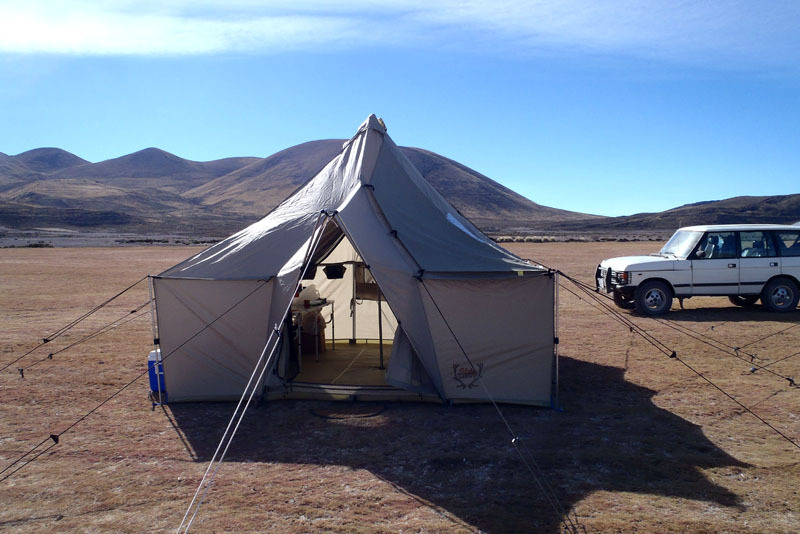 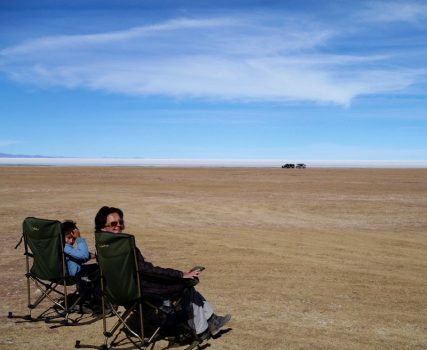 We inspected the fantastic Tented Camp facilities where our guests will be able to stay to complement their visit to the Salar with an overnight in true wilderness. Travelling with children is possible and fun so long as the children are seasoned travellers, because it is tough. Nico had altitude sickness and needed to be given oxygen for the two first nights at high altitude, but that was enough and he had a good night’s sleep and fine days. 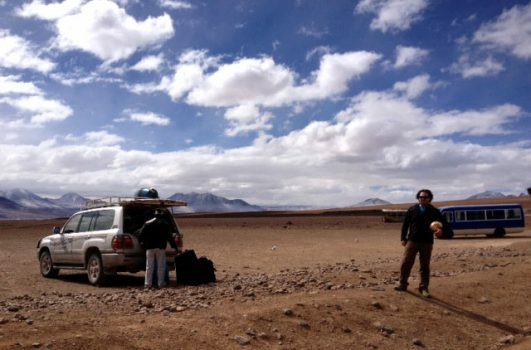 Even the most remote hotel was well equipped with an oxygen tank delivered to our room, and we were carrying oxygen in the car with us at all times. 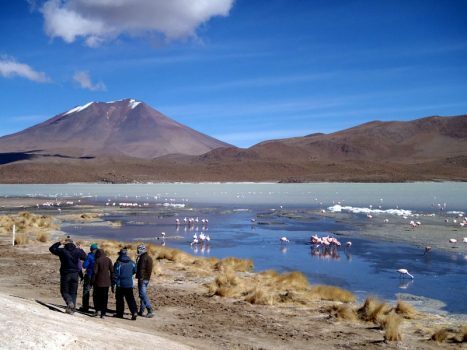 The attractions in this trip are many for children, including volcanoes, flamingoes, geysers and sleeping in a salt hotels! I would also recommend a good supply of gadgets. 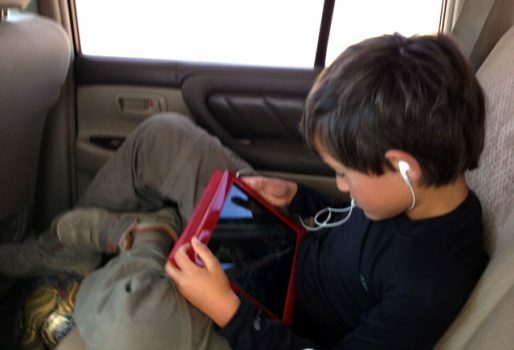 We carried an iPod touch an iPad and an an iPhone 4 S. We have board games (Monopoly and Scrabble), a good supply of music, Nico has his own games and a few rented films on the iPad to watch during endless drives or log evenings. We enjoyed the Muppets and Journey 2 during our long drives. 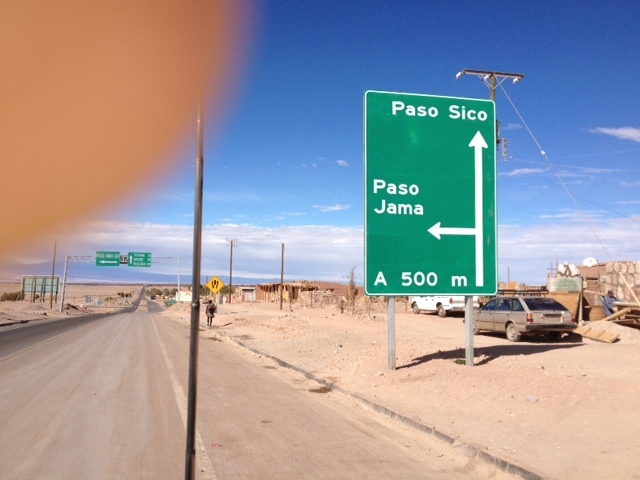 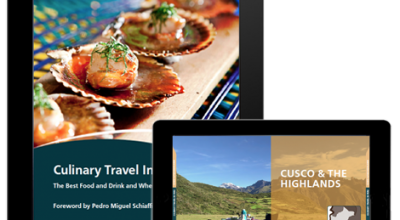 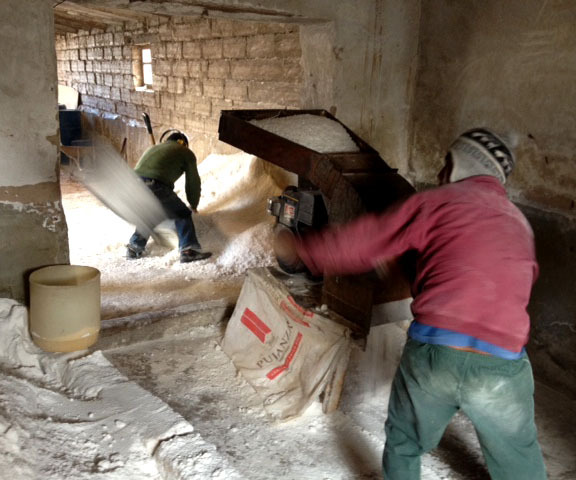 Next, Potosi and Sucre, so stay tuned! 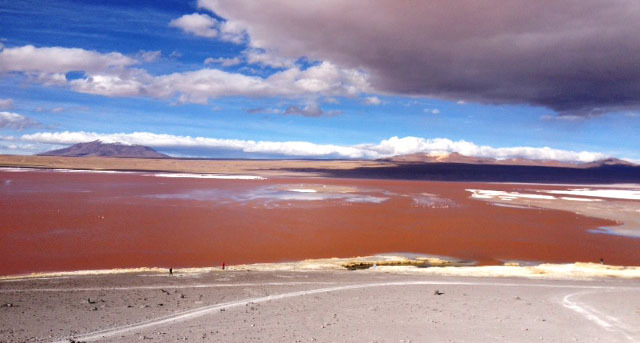 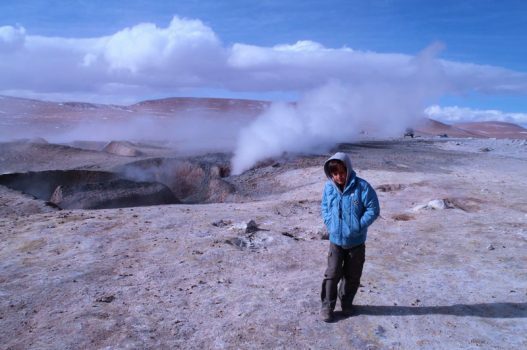 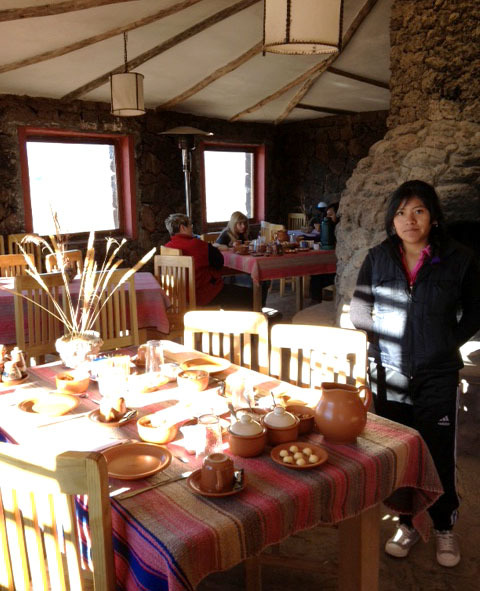 This is one of a series of reports from Marisol’s trip across Chile, Bolivia and Peru in July 2012, for full details: Sand, Salt, Sierra and Selva.